Sangyé Lama (Tib. སངས་རྒྱས་བླ་མ་, Wyl. sangs rgyas bla ma) (1000-1080) — the first tertön, or revealer of spiritual treasures (termas) hidden by Guru Rinpoche for the benefit of future generations. He was the first incarnation of Gyalsé Lharjé—one of the sons of Mutik Tsenpo and the immediate incarnation of King Trisong Detsen. One of his main termas was Tsa Sum Dril Drup (Wyl. rtsa gsum dril sgrub), which was later rediscovered as a yang ter (Wyl. 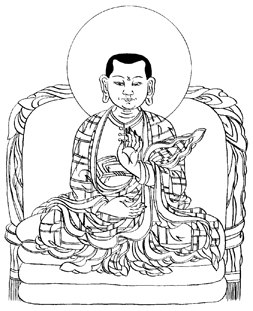 yang gter) by Jamyang Khyentse Wangpo—the thirteenth emanation of Gyalsé Lharjé. Dudjom Rinpoche, The Nyingma School of Tibetan Buddhism, Its Fundamentals and History, trans. and ed. Gyurme Dorje (Boston: Wisdom, 1991), page 751-752. This page was last edited on 1 April 2018, at 22:14.